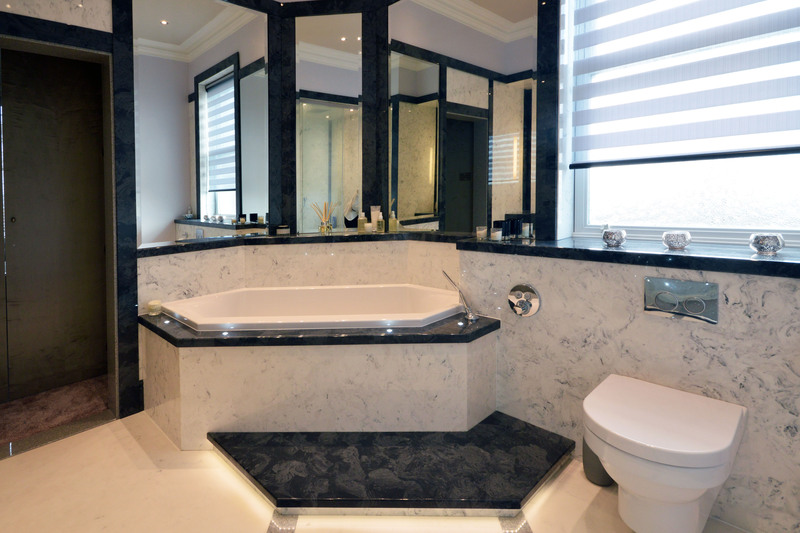 Versital is proud to have been chosen by the renowned interior designer Langley Interiors to provide a full range of bathroom surfaces for their project, including vanity tops, wall panels and a shower tray for this luxurious bathroom design. The finished bathroom is a beautiful example of the versatility of Versital bathrooms surfaces and what can be created with good design. 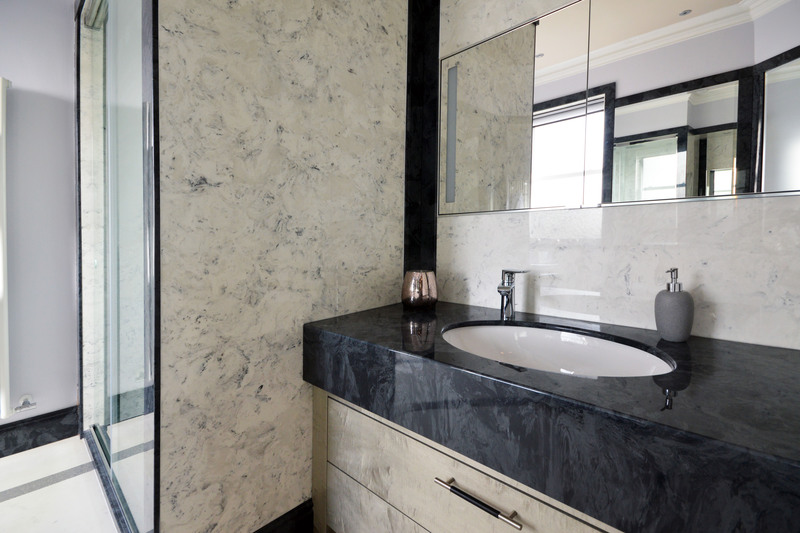 The much coveted ‘Arabesque’ marble surface has been selected to create a truly timeless bathroom. Used as the main feature, the Carrata style white ‘Arabesque’ wall panels emanate a sense of luxury due to their subtle beauty and natural look. 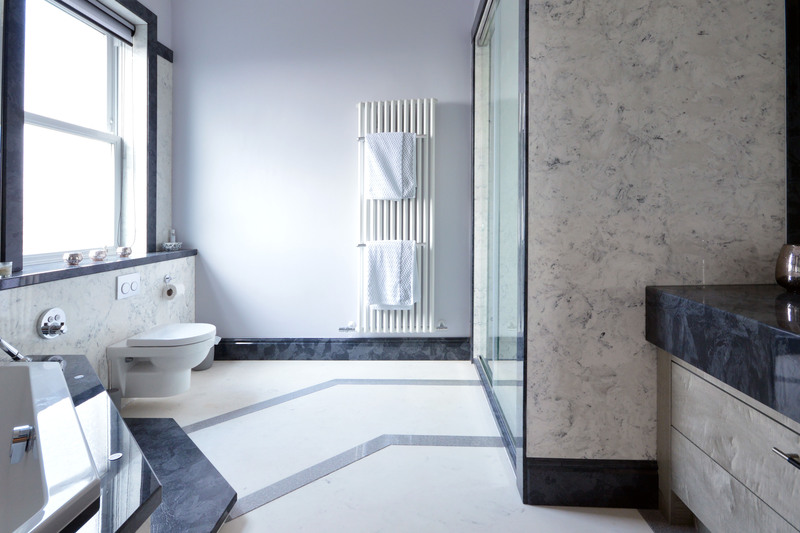 Another major benefit of Versital over real marble is that all surfaces are also fully waterproof and stainproof as well as easy to clean, making them the perfect choice for any bathroom. Versital has been featured in the shower enclosure as well as the splash back behind the sink and the bath surroundings, again using ‘Arabesque’, bringing a brightness to the room. Used with a contrasting grey for interest in a style, creating a really beautiful result. 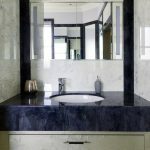 Versital’s luxurious marble surface ‘Gloucester’ has been featured to highlight key bathroom areas. Used to create a stunning vanity top with a prominent drop edge ‘Gloucester’ fits the design specifications – calling for a premium look – perfectly. ‘Gloucester’ is the ideal alternative for anyone wishing to have a slate effect finish, but also being totally waterproof and stain proof. The top features a custom cast out for an undermounted sink, with a rounded edge that blends in seamlessly with the corner panels above it. 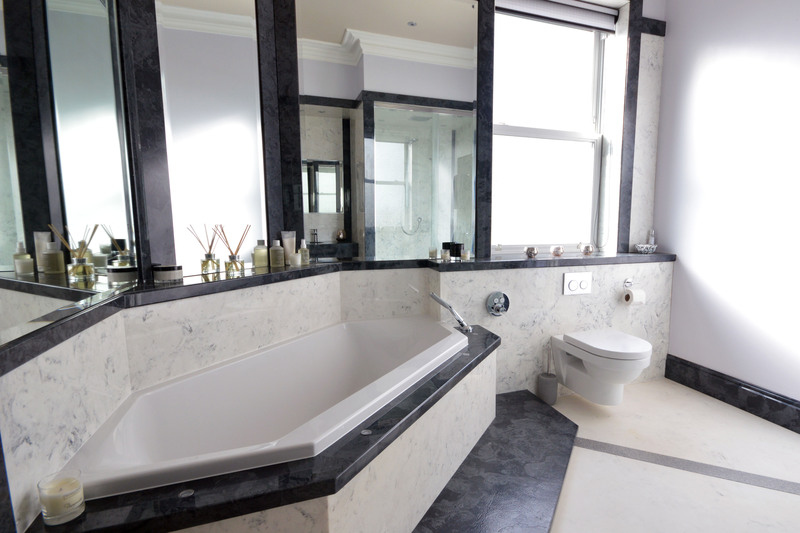 Dark grey elements have also been featured around the fully built in bathtub, as well as the shower enclosure. Incorporating built in feature lighting around the bath and surrounding areas, the prominent marble veins of ‘Gloucester’ create a beautifully luxurious feel. Similarly, the outside edge of the shower enclosure is embellished with the dark grey surface, matching continuously with the its’ interiors. View the full project in the image gallery below.